Brisbane-based ethical food business Food Connect Shed has raised nearly $1.2 million from the public to create Australia’s first community-owned food hub. Food Connect Shed director Robert Pekin is excited about the significant impact investment coming into the hub. “Investing in social impact is still a new concept here in Australia,” Mr Pekin said. The first Food Connect Shed lease was effectively crowdfunded from their early customers ten years ago. “Our supporters pre-bought veggies, so we could move into our first space. That was the first time we realised the true value of our crowd in the movement we were building” says Robert, Food Connect’s original co-founder. Robert has been one of the leaders in the Fair Food Movement in Australia, pushing for fairer farm gate prices for farmers and more transparency for consumers. This led the Food Connect team to launch Food Connect Foundation, to support their advocacy and education programmes. “It feels like we’re at the beginning of a new stage of what the positive economic impacts of a regional food system looks like , and how we value people and the planet. There’s still a way to go, but we have to apply every intervention we can to solve some of the world’s biggest problems: food security, dealing with climate change, and social inclusion” says Robert. 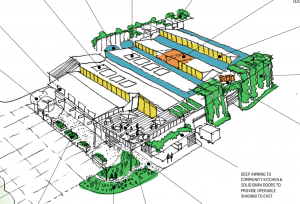 The Food Connect Shed equity crowdfunding campaign has been running for eleven weeks, and 450 investors have pledged almost $1.2 million to date, plus the new tenants have pre-committed around $500k of site improvements. They have three days to go to hit the minimum goal of $2 million, or the money won’t be processed.